Good evening friends, followers and whoever else stumbles upon this post. After much anticipation here it is - the post I've been promising for the last week. In my quest to become a healthier human being and kill the evil beast that lives inside of me (which I'll tell you more about later) I've been turned on to this fabulous list. We all know eating totally organic is expensive and can be difficult depending on where you live. For the last few years I've preached local over organic, and I still believe It is very important to eat locally and seasonally as much as you can, but when you're health is in jeopardy you do what you gotta do. This list of the twelve fruits & veggies with the highest amount of pesticides vs. the fruits and veg with pesticide levels are much lower and safer for consumption. If your not sure why pesticides are bad ask yourself this "what do pesticides do?" Hmm... my simple minded logic tells me that "pest" refers to a bug and "icide" from the word suicide which means to kill yourself. From all that I think it's safe to say that pesticide must mean to to kill a pest. How would one kill a pest? Quite clearly the best possible answer would be to use poison - the cheapest most effective way to wipe out as many pests as possible in one shot. So if pesticides are bug poison and our fruits and veggies (while still growing) are constantly being showered in this bug poison, aren't we to assume that some of this said bug poison has permeated throughout the fruits and veg that are supposedly safe to consume. I would bet that the majority of the poison doesn't wash away with soap & water. That's right we consume this bug poison with every single bite and if pesticides can kill bugs what are they really doing inside of our bodies. If you think that pesticides don't effect humans well then you are dead wrong! Pesticides in food can cause all sorts of problems for humans including skin ailments, stomach problems, hormone imbalances, difficulty with vision and cancer. I'm going to leave it at that and get back to the fact that this list is simple & easily allows you to make an informed decision when buying healthy produce for you and your family. There are only 12 things you absolutely must buy organic! The clean 15 are the safest and anything not listed sort of falls in between. Another way to avoid pesticides is to buy greenhouse grown which we do a fair amount of in Canada, lucky us, I'm already enjoying beautiful tomatoes and cucumbers in April. For a more comprehensive list check out this link. Hello friends. Yes I know I promised a special not to be missed post on the dirty dozen. The post is on it's way taking a little longer then expected. Last week #TheFoodingCompany was slammed with a bunch of passover orders. As I've been told by a bunch of happy well fed family and friends the holiday orders went over very well. We catered two full seders from start to finish including a number of parve desserts that actually came out pretty delicious. Who knew desserts without butter or flour could be so good. I hope everyone - Jews & Christians had a wonderful holiday weekend. Today I'm going to let you in on a wonderful (& healthy) dish i've become obsessed with. I eat for breakfast or after dinner for a sweet treat. 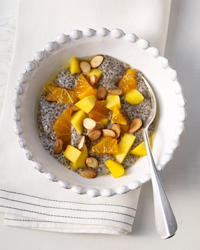 If you've never heard about it chia seeds are the new posh health food item. I first bought it a few months ago having no clue what it was or how it was eaten. I saw it on a shelf at my go-to grocery store Lady York next to some sesame crisps snacks and fancy tamari almonds. The packaging looked cool and It seemed to have a good balance of fiber, protein and calcium. I first tried putting the chia seeds into a protein shake. It had a weird slimy texture - I wasn't into it at all. It actually took a few months and going through a detox to find out the best way to consume this super food to realize how much I really love it. 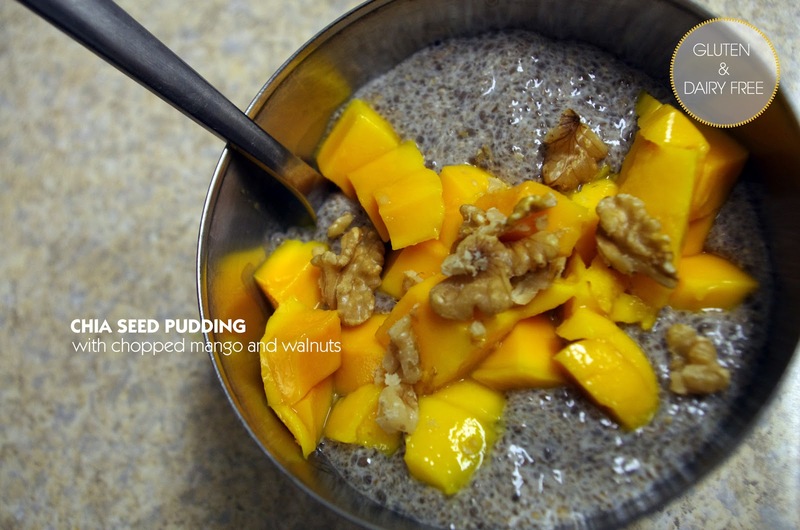 I had seen this beautiful photo in Food & Wine magazine and when I was told by my Naturopath I would have to eliminate dairy & sugar from my diet for a while I decided it was the perfect time to try out the pudding. What I have found is that fruits that are slimy just suit the texture of the pudding better, kiwi and mango are two of my favorites, however if you are watching your total sugar intake raspberries are great too. PREP: Whisk chia, almond milk, stevia & cardamom. Refrigerate at least 4 hours or over night to set. SERVE: Chop up desired fruit and or nuts and enjoy. No this is not what I ate over the weekend! As most of you know by now I'm at the end of a three week detox cleanse, that looks like it's going to last a lot longer then the initial three weeks. Today I'm reminiscing about a late breakfast I shared with a friend last month. We were starving and had worked all a.m. We wanted something satisfying and fast. Boy did this feast dance on our taste buds. There isn't a recipe for anything obviously. But just for some insider info the green plate is a chimichuri spread, the ham is fried sausage (sweet & hot), the shrimps were dusted in smoked & sweet paprika and pan fried. 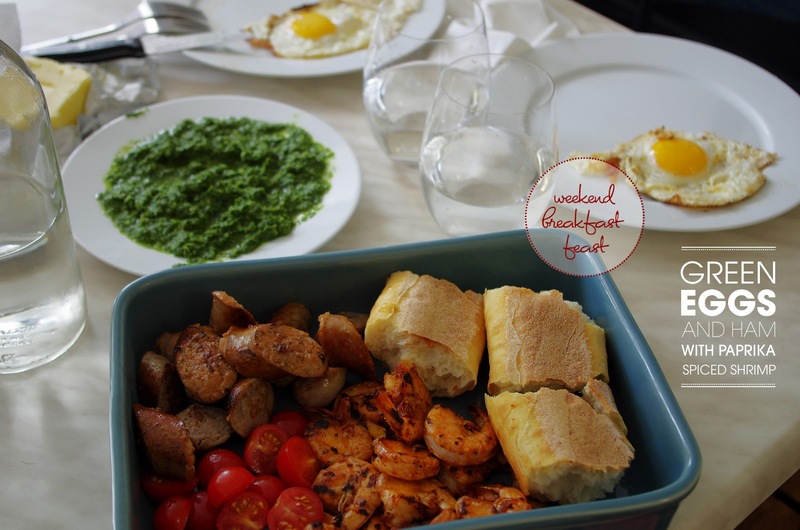 Everything came together like all good breakfast feasts do, with fresh baguette & room temp salted butter. In about 20 minutes I was well on my way to being in a happy fat kid food coma. Give this combo a try next time you feel like feasting your way through a Sunday afternoon, but don't plan too much for the rest of the day. 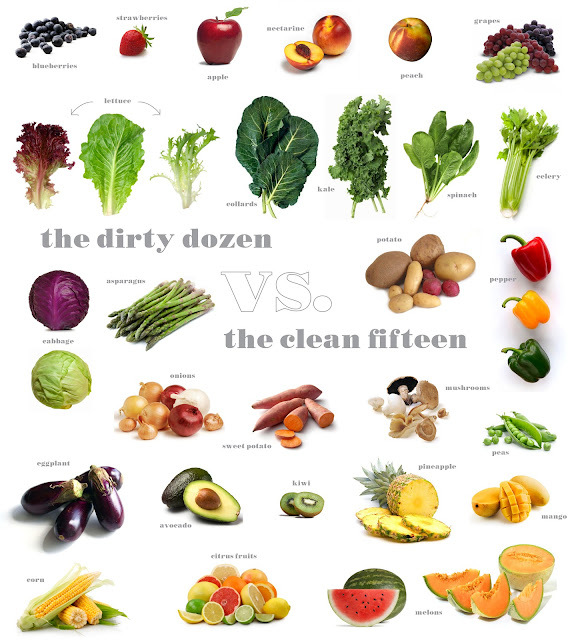 Check back later this week for a very important post about "the dirty dozen vs. the clean fifteen" you don't want to miss it!